CD review: "Sooner or Later"
This review first appeared in the September 4, 1992 issue of the North County Blade-Citizen (now North County Times). 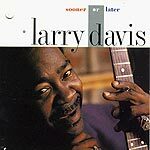 Larry "Arkansas" Davis has long been one of the most undeservedly underrecorded blues artists around. Already famous among those lucky enough to have seen him live, his new release on Rounder's Bullseye subsidiary label should get him wider fame among those of us with children and others who don't get out much. A sophisticated guitarist and singer, Davis' "Sooner or Later" has a strong streak of jazz through it (much like Chicago guitarist Fenton Robinson's work). No fretburner, Davis' concern is with finding the right note, not playing the most notes. It's a search that's successful more often than not.